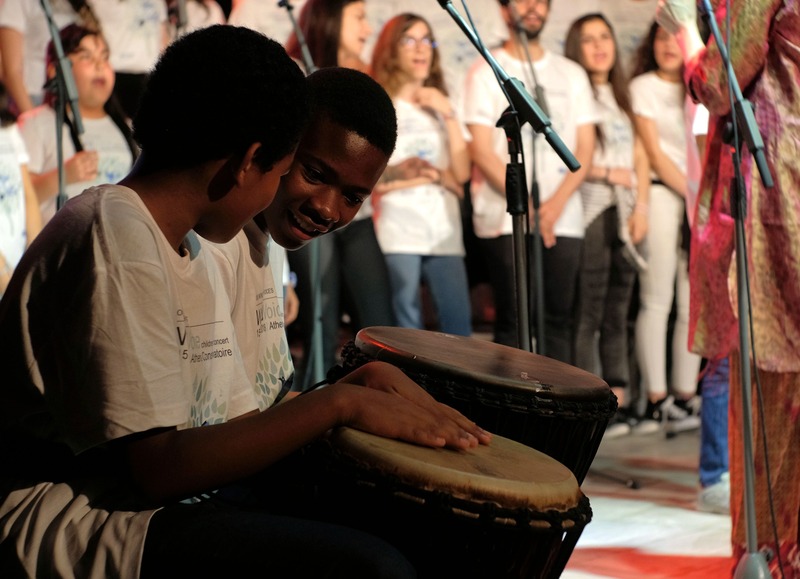 On 15 May 2018, the British Council, in partnership with UNICEF, hosted a World Voice children’s concert at the Athens Conservatoire, Greece. The Skaramagas Refugee Camp Children’s Choir, featuring children aged 12 to 18, collaborated with other local children’s choirs from Elix and Metadrasi to showcase a collection of songs from the growing World Voice Songbook. Over 30 children of different nationalities came together to take part in the concert, featuring music from all over the world with songs in over seven different languages including Senagalese, Chilean and English. World Voice songs performed at the event included “Milo mou Kokkino”, “La Petaquita, Bebe Yo”, “Peixe Vivo”, “L’Inverno e Passato, Kpanlogo”, “Yellow Submarine” and “I Am”. The choir also sang a new song “Don’t Call Me Stranger” which was composed by the children themselves during rehearsals. In addition to the children’s choir, the evening featured special performances from the Vougioukli sisters, Eleni and Suzana, and El Sistema. Rehearsals took place from March to May 2019, with World Voice’s UK vocal lead, Jane Wheeler, on hand to offer direction, working closely with World Voice Master Trainers, Nikos Ziaziaris and Fani Morali. In turn, Nikos and Fani worked closely with the children from each organisation in preparation for the concert, learning World Voice repertoire and vocal techniques. This unique experience enabled further integration of young refugees into society with a goal of empowering and motivating the children to enjoy learning through music and creativity: “When I’m singing, I feel perfect,” said Samir, a participant from Elix. "Music and singing speaks to children. It's one language, universally, that they share. [World Voice] can work with children who are hard to reach who have struggled in their lives"
Our World Voice programme enhances children's wellbeing and their learning of a range of subjects from history to language, through the act of singing. This vibrant, growing movement began in 2013 in Senegal and India and first began in Greece in 2017 when UK vocal lead Jane Wheeler delivered her first training session in the country for 35 teachers and youth workers. The following month, after a period of intense training on how to embed song as a tool for learning, 15 participants were invited to become World Voice Master Trainers and help cascade the programme across Athens. Further training sessions with UK leads enabled these selected classroom teachers and practitioners working with refugee children to learn how to integrate singing into educational methodology, support children in their learning and help build their social confidence. Alongside the World Voice programme, the British Council jointly runs a Learning Centre at the Skaramagas refugee camp with UNICEF, and funded by ECHO, where children participate in workshops and learn through song. The Skaramagas camp’s choir was formed as a result of the programme, and made up of children from Syria and Afghanistan along with young Yazidis from northern Iraq.